He may not wear a lab coat, but Johnson & Johnson (that's his name!) 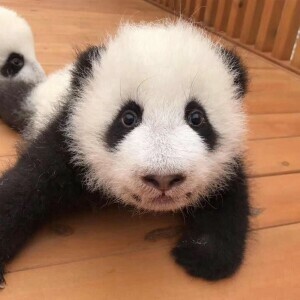 is a member of the family, thanks to a conservation partnership between Xian Janssen and the Shaanxi Academy of Forestry Qinling Mountains Giant Panda Breeding Center. We catch up with the mischievous youngster on the anniversary of his adoption ceremony. Johnson & Johnson's pandas, that's what! In September 2017, Xian Janssen, part of the Johnson & Johnson family of companies located in Beijing, China, and the Shaanxi Academy of Forestry Qinling Mountains Giant Panda Breeding Center kicked off the second phase of their partnership to protect giant pandas by announcing a further three-year commitment to support breeding research and public education on conservation. They celebrated this ongoing collaboration, which began in 2007, with an event called the 2017 Newborn Giant Panda Naming and Adoption, which marked the first 100 days of life of three giant pandas that were adopted by Janssen. One year later, we’re checking in with one of the babies, named Johnson & Johnson Johnson & Johnson,Panda, to learn about his life in China—and the important partnership that's helping protect pandas like him. I was born in the Shaanxi Academy of Forestry Qinling Mountains Giant Panda Breeding Center, in Xi'an, the capital of Shaanxi Province. 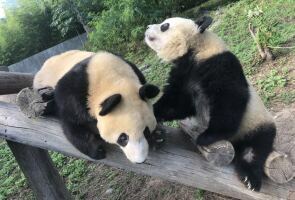 It was established in 1987 as a research and education center focused on rescuing and breeding rare animals, including giant pandas, to support their wild populations. They also have educational initiatives, including tours for students, and they do research into field rescue, food management and overcoming breeding challenges for giant pandas. But I won't live at the Breeding Center forever. Once I am old and strong enough, I'll be released into the wild to help rejuvenate the panda population in the Qinling Mountains. Why were you named Johnson & Johnson? I was named Johnson & Johnson after the parent company of Janssen, of course. It’s part of Johnson & Johnson’s Credo to give back to the community, and Janssen has been an active corporate citizen in Xi’an since the company first arrived in 1985. Their partnership with the Breeding Center has supported major breakthroughs in artificial breeding, and fostered the growth of the giant panda population in the Qinling Mountains. Additionally, because pandas are a symbol of friendship and peace in China, Janssen felt that naming me after their parent company would be a symbol of their ongoing commitment to Xi’an and the Breeding Center. It’s a name that, in my opinion, makes me especially strong and healthy! My two best friends are Shanzai and LuLu, who were also born in June 2017. We are so close that some people can’t even tell us apart—they call us the Three Musketeers. What were the first days of your life like? Pretty harrowing, actually! Less than 12 hours after I was born, my mother accidentally scratched my bottom with her claws. Fortunately, the staff at the Breeding Center disinfected the wound in time and I quickly recovered. There are some older pandas at the Breeding Center, too, who were also adopted by Janssen. But since adult pandas tend to live alone outside of mating time, we don’t see them often. How would they describe your personality? They think I'm lively and a little bit naughty! I like to play with all sorts of things, so I’m a fun guy. I like to chase after toys, play with water, roll in the grass and swing in the hammocks. But when I’m tired, I don’t want to be disturbed—I pull down my big furry ears and really relax. The Breeding Center has nearly 400 acres of land, so there are lots of places to explore in the outdoor activity area, including groves, habitats and pools. I also like to climb trees, and eat bamboo leaves. Speaking of, it's time for me to get back to playing. Since I speak neither Chinese nor English, I’d like to thank the staff at the Shaanxi Academy of Forestry Qinling Mountains Giant Panda Breeding Center and Qi Xinjian Qi Xinjian, Head of Communications and Public Affairs, Xian Janssen, Head of Communications and Public Affairs, Xian Janssen, for their help with this interview. Get the full scoop on how the company has worked with the Shaanxi Academy of Forestry Qinling Mountains Giant Panda Breeding Center to protect these rare animals since 2007.